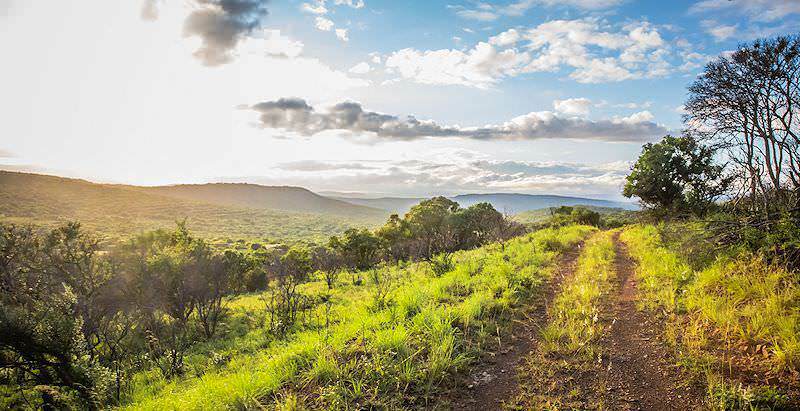 Mkhuze Game Reserve is a verdant piece of paradise in the Zululand wilderness. Mkhuze Game Reserve lies east of the Lebombo Mountain range and was proclaimed in 1912. It hosts a larger variety of animal species than most other reserves similar in size. The Mkhuze Game Reserve, 40 000 ha in size, is named after the Mkuze River, which in turn is named after the lavender trees that grow along the banks of the river. The river is known for its large crocodile population. With the mountain on the one side, the riverine forest on the other and the tall trees of the savanna in between, Mkhuze Game Reserve is a real gem in the lake region of KwaZulu-Natal. It is a place with plenty of beauty and large contrasts. Mkhuze Game Reserve's vegetation varies from sand forest to thick bush to savanna, with its gigantic sycamore fig forest trees being the most impressive feature. There are close to 80 species of mammals and 420 different bird species which have been recorded in this area. The Mkhuze Game Reserve has large herds of impala and other mammals include white and black rhinoceros, giraffe, nyala, blue wildebeest, kudu and warthog. Cheetah, hyena and leopard can be spotted by lucky visitors. Game viewing and bird watching are far more fun when conducted from the hides situated on the pans. The Nsumo Pan is regarded as a king-size bird-bath and you will find plenty of water fowl, pelicans, and wild geese here. We offer the widest range of vacation options to the country of South Africa. Travel to Botswana for an unforgettable and immersive safari experience. Namibia is an immense desert country with captivating destinations like Sossusvlei. Zambia's remote parks may be cumbersome to reach, but offer rewarding safaris. Zimbabwe is known for its superior view of the Victoria Falls. Mozambique's far-flung archipelagos offer the ultimate in barefoot luxury. The Kruger National Park stretches over two South African provinces in the wild northeastern corner of the country. The Sabi Sand Private Game Reserve shares an unfenced border with the Kruger Park, ceding a spectacular free flow of wildlife. Cape Town offers every adventure, from climbing Table Mountain to cage diving with great white sharks. The Garden Route is a verdant coastal corridor that connects two of South Africa's beautiful Capes - the Western and Eastern.